Not only does Henley know how to make the most of it’s natural beauty but it also knows how to throw a party or two, with its biggest festivals of the year; Henley Festival (11th– 15th July 2018) and Rewind (17th – 19th August). Henley really comes alive throughout the Summer months which only enhances its traditional reputation of a market town nestled in the relaxing Chiltern Hills of Oxfordshire. Packed with some of the Countries most highly esteemed eateries, you will be able to bask in gorgeous open fires and inviting sofas with the opportunity to eat Michelin Star level food in the comfort of your wellies. If you’ve ever visited Henley on Thames, it would be hard to have missed the largest fleet of boats on the Thames, owned by Hobbs of Henley. Synonymous with the Henley name, the Hobbs family have been building and chartering boats since 1870 and aren’t about to stop anytime soon. Boats have been around since 7600 BC according to records, and it’s still very much a lifestyle for some and a hobby for many. There’s nothing quite like just messing about on the river. Hobbs of Henley was founded by Harry Hobbs five generations ago now, Harry was a part time publican part time pleasure boater. It’s fair to say, he knew how to live! In 1870 the company had begun to start trading along the river, taking passengers out on the water and really introducing the people of Henley to a way of life that would continue to evolve over the next couple of hundred years. In 1913 the family even began building boats themselves from the bottom up so to speak, such as The Enchantress, which has been used on several occasions to transport none other than The Queen herself. Henley on Thames is probably most famous for its world class Regatta though which takes place for five days in the Summer (4th– 8th July 2018). The course in which the rowers now race was also built by the Hobbs family back in 1920 and although a lot has changed since then with the event and the town, Henley Royal Regatta continues to grow in success and attracts some 200,000 visitors. To put that into perspective, that’s around 20,000 pints of Pimms sipped, 4,500 bottles of Champagne popped, and 1 tonne of strawberries consumed- definitely worth a visit as you will not see this many Olympic rowers anywhere else at one time (oh, except for maybe at the Olympics themselves…). Throughout the late sixties, the Hobbs family were busy compiling a cruiser fleet, all the way up to present day, growing their business hiring out boats to the public for either little jaunts up the river to grand parties along the banks in the much larger vessels. The Queen continued to make visits to Henley on Thames and was, of course, welcomed by both the community and the Hobbs Family who transported her and the Royal Watermen on their boats. This was for occasions such as the opening ceremonies of prestigious venues like The River and Rowing Museum and should The Queen visit Henley again anytime soon she would be accompanied by the current Managing Director, Jonathan Hobbs, who has also recently become a Royal Waterman. No boating experience would really be complete without a delicious local beverage to help take in the scenery. Thus, in 2017 Henley’s First Highly Spirited Gin was born, Mr Hobbs Gin. Named after the man who started it all Mr Harry Hobbs, you will see his face proudly emblazoned on the bottle, decorated with nautical rope and the design inspired by some of the original Hobbs of Henley watercrafts. Harry was renowned locally for his flamboyant beard and mischievous nature and he was often seen on the river around 11am on his punt enjoying a gin. The botanicals included in the drink are Angelica, Marshmallow, Lime flower, Lemon peel, Orris root, Juniper but the seventh remains a family secret. 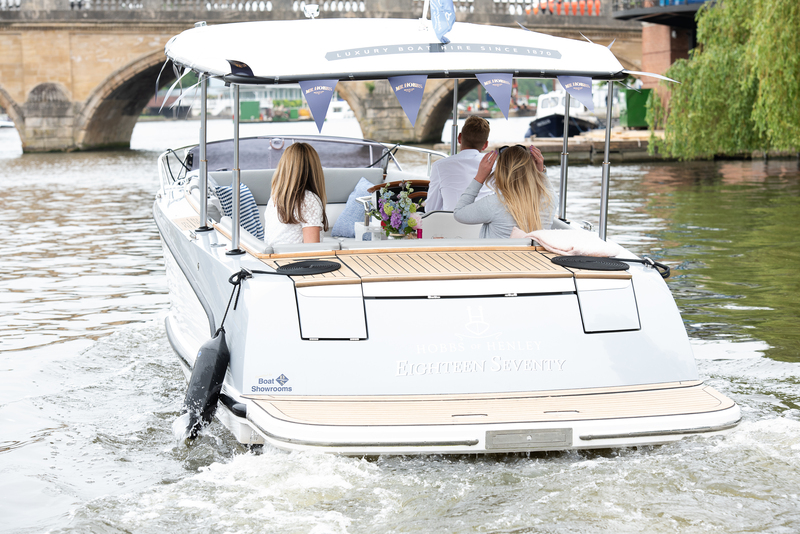 The gin was launched to mark the company’s upcoming 150th anniversary so if you’d like to explore Britain’s most historic river with a Mr Hobbs Gin in your hand or just relax and let the world drift by, there’s no better way to start than with Hobbs of Henley. The family run several Gin Tasting and Gin & Fizz cruises throughout the year upon their larger passenger vessels such as The New Orleans paddle steamer and the luxurious Waterman, gin is luckily something that can be enjoyed whatever the weather regardless of what the British forecast has in store. Based right in the heart of the beautiful riverside town of Henley-on-Thames and just 40 miles away from London, you can experience your very own self-drive adventure from their huge boat hire selection as well as public cruises, private charters and all the while enjoying their cherished family tipple.